Winter 2014-2015 is shaping up to be a study of opposites that is almost fitting of Charles Dickens’ Tale of Two Cities. Yet, even with a large price disparity between East and West, there is good news to be found in the data for East Coast natural gas consumers. Compared to 2013-2014 — the treacherous winter of the Polar Vortex — natural gas prices are lower than a year ago as can be seen in the following chart. Partial credit for this development belongs to the advanced winter planning done by electricity generators. In New England, where half of all power plants are fueled with natural gas, the devastating cold last year sometimes left generators with no fuel. This year power plant owners locked in natural gas and oil contracts early. ISO New England even provided an end-of-season cash-out opportunity to generators that meet its early reliability goals. Credit also goes to the lack of extreme demand in the West and higher-than-expected natural gas storage inventories after they were greatly depleted last year. Residential gas customers benefited directly as well. Eversource Energy, a distribution utility with service territories in Connecticut, Massachusetts, and New Hampshire, has proposed cutting customer bills in Massachusetts by approximately $20 a month in March and April to better reflect the actual prices it will pay for natural gas. National Grid, the distribution utility that serves Boston and Northeastern Massachusetts, already cut rates in January and February, which saved customers an average of $20 a month. Still, it doesn’t sit well with many people in Massachusetts that their neighbors in New York pay less for natural gas. The cost of heating a home or a business and the cost to generate electricity is higher in New England because the region lacks the capacity to deliver adequate natural gas supplies. However, if this is indeed the case, why is a proposed new pipeline project from Kinder Morgan’s Tennessee Gas Pipeline, which would bring up to 2.2 Bcf/d of natural gas to Massachusetts, so controversial? Despite the high prices and supply constraints, customers do not want the environmental impact or the cost of building a new pipeline. Kinder Morgan hopes to soon receive permission from the FERC to move forward with the pipeline with a goal of being operational by the end of 2018. However, many landowners along the 180-mile route oppose the project and have publicly spoken out against it. It seems 2015 will be a contentious year for both sides as this proposed project moves through the FERC certification process. Whether the Kinder Morgan pipeline project goes forward or whether another large project or series of smaller pipeline projects take its place, New England will need to add natural gas pipeline capacity to keep up with new demand and to make adjustments as it retires old nuclear and fossil fuel electricity plants and puts gas-fired plants in their place. It is unlikely that the region can maintain its ambitious plan to retire older power plants and replace them with more environmentally benign gas-fired plants through increased energy efficiency alone. New York will need to add capacity as well if it wants a chance at lowering its average natural gas price to a range similar to that in the Midwest and Western states. In the meantime, we will ride out the remainder of Winter 2014-2015 and hope that next year the weather will not be so drastic on either coast. Dickens never wrote “it was an average time,” but after two extraordinary winters, that may be exactly what the gas industry needs. U.S. Energy Information Administration, “Natural Gas Weekly Update,” February 25, 2015. 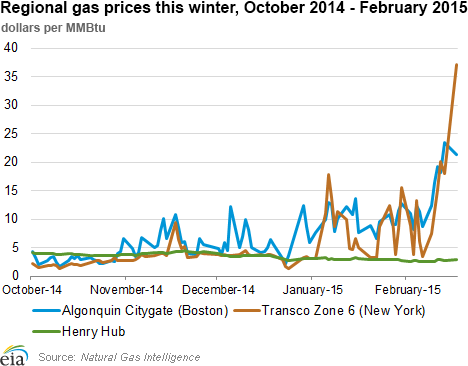 DiSavino, Scott, “As New England Freezes, Natural Gas Stays Cheap,” Reuters, March 1, 2015. Kinder Morgan Web Site, “Tennessee Gas Pipeline Northeast Energy Direct (NED) Project,” March 3, 2015. “Kinder Morgan Pipeline Best Energy Supply Proposal for Mass,” Lowellsun.com Opinion, February 17, 2015. U.S. Energy Information Administration, “Natural Gas Weekly Update,” February 18, 2015. Newsham, Jack, “Baker Calls for Input on Paying for Gas Pipeline through Electricity Bills,” Boston Globe, February 25, 2015. 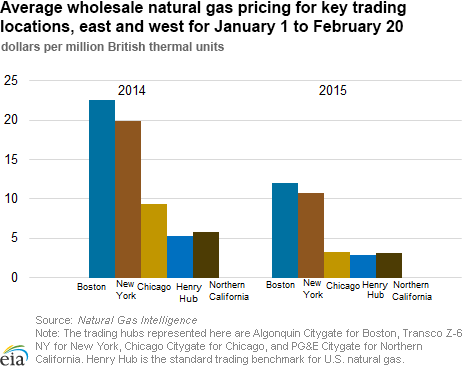 Newsham, Jack, “Everysource Aims to Cut Its Price for Natural Gas,” Boston Globe, February 23, 2015. Serreze, Mary, “Kinder Morgan Natural Gas Pipeline Friends, Foes Gear Up for Battle in 2015; Events Planned,” Masslive.com, January 19, 2015. 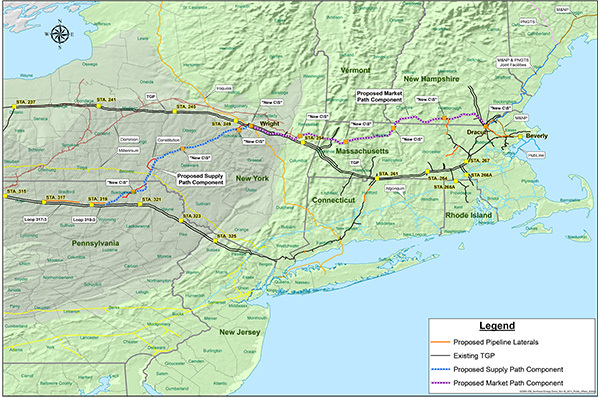 Zeller, Tom Jr., “Natural Gas Pipeline Plan Creates Rift in Massachusetts,” New York Times, July 10, 2014. This entry was posted in Natural Gas and tagged Combined cycle, Natural gas industry, Natural Gas Markets, Natural Gas Prices, Natural gas supply. Bookmark the permalink.